The Cheese Chap: Do washed rind cheeses get enough respect? I had an interesting chat with Cumbria-based cheesemaker and monger Martin Gott the other day. He reckons too many cheesemongers treat washed rind cheeses as the “joke” of the counter because of a lack of understanding. Gott has just developed a new unpasteurised washed rind cheese called Brother David, which joins his long-standing washed rind ewes' milk cheese St James (pictured above), both of which are sold by Neal's Yard and in his shop Cartmel Cheeses. Gott showcases a wide range of washed rind cheeses in his shop, stocking up to a dozen different styles, including Muntser, Cardo, Stinking Bishop, Adrahan, plus his own cheeses. Gott's cheese making business is based at Holker Farm on the Holker Estate, where he and his partner Nicola Robinson have around 180 Lacaune sheep. The new Brother David is made with milk from four newly bought Shorthorn cows to fill production during the winter months when sheep's milk is not available. 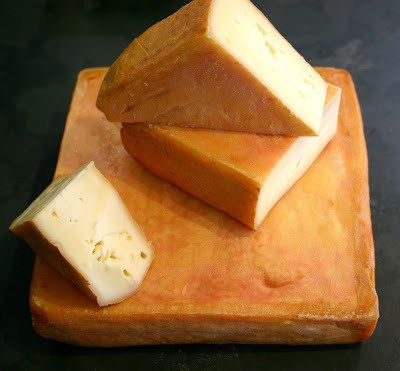 Washed in water everyday while it matures over five weeks, the cheese has a smoky ham and long milky notes. “It's somewhere between a Langres and a Munster, but has its own distinct characteristics,” he said. What do you think? Are washed rind cheeses under-rated? Do you struggle with the powerful smell that some have? Or should cheesemongers give us more credit? I think because levels of production are generally lower its less widely available than other styles and if people come across it they're wary to try something new. I love washed rinds! That's where the cheesemonger needs to know his/her stuff and not market them as just being pongy cheeses, I suppose!They're definitely becoming easier to find, which is good.